Created a profile @ 6:00 am this morning and right after logging in a few minutes ago my doorbell rang and my new YS640 was delivered! I'm so excited to own my new smoker and ready to do the initial burn so that I can start cooking on it. 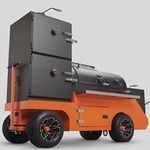 Feel like a little kid again which I'm sure all of the guys & gals who've purchased a Yoder smoker remember? Just completed the initial burn in and my unit is now in cool down mode. After watching the initial temp overshoot on the ramp up it slowly came back down to right around 350 degrees. I'd watched a lot of videos and read many posts about what to expect so I didn't freak out. Thinking trying my hand at smoking some baby back ribs later today! Woohoo, I love my Yoder!